South America; Lake Valencia basin in Venezuela. Males have more elongated fins, especially the dorsal fin, than that of the females. A generally peaceful community fish, keep in groups of 6 or more. Do not keep with nippy fish such as Tiger Barbs. Will take most foods including pellets and flake as well as live/frozen food such as bloodworm and brine shrimp. Appreciates a densely planted tank with cover to hide and some open swimming space. Does best in acidic or peat-filtered water. The Diamond Tetra has elongated fins which are generally translucent in colour. 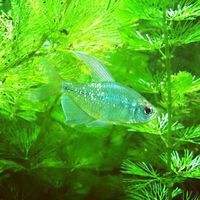 The body is oval shaped and green to silver, similar in body shape to the Serpae Tetra. It gets its name from the shimmering scales that develop when mature. In reflected light the scales can have a violet to gold iridescence. The upper part of the iris is red to orange.